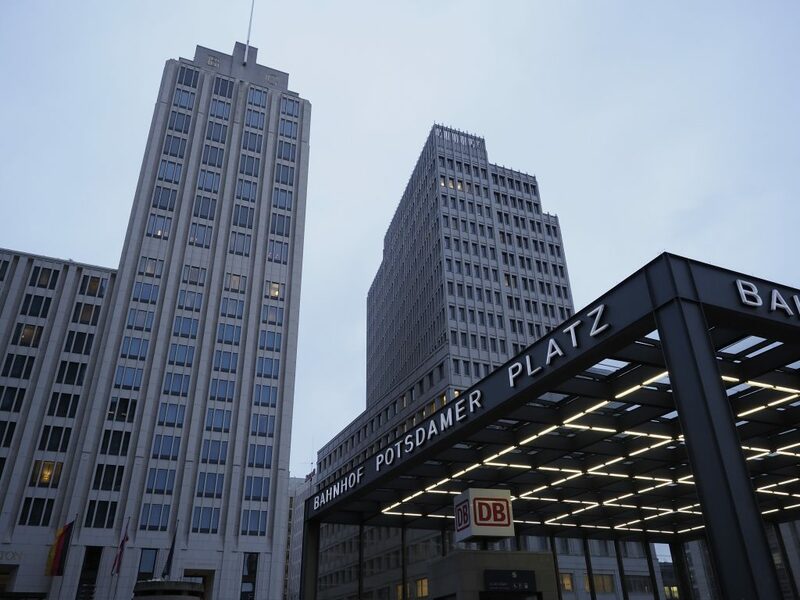 I visited Berlin over the Christmas period, a City I’m very familiar with having been on numerous occasions and took the time to visit the outer provinces, including Potsdam and Mexikoplatz, in the process making some interesting observations, especially regarding concrete carbonation. 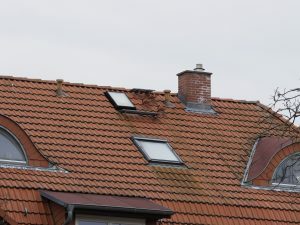 I guess it’s an occupational hazard that I’m interested in seeing or detailing any interesting approaches taken to dealing with building defects in other countries and of course taking any lessons that can be learned and applied to the UK. 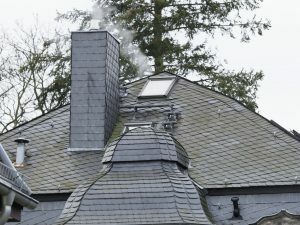 It was extremely interesting to note that a lot of buildings in Mexikoplatz have high level access built in to the roof structure to enable chimneystack maintenance. 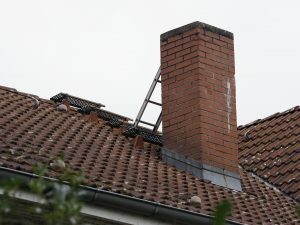 This often entailed that steps or ladder structure being accessed from a roof light, whereby, so long as a harness was worn, then chimney inspection and maintenance should be a relatively simple and inexpensive task. 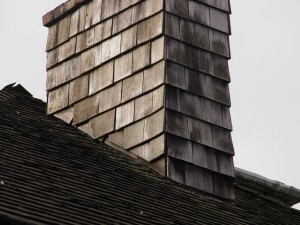 I was also struck by the importance given to roof ventilation, wherever mansard roofing or rooms in roof space were found, using the roof space for accommodation seemed a fairly common approach and clearly the phenomena of interstitial condensation with the roof structure had been well recognised and addressed. 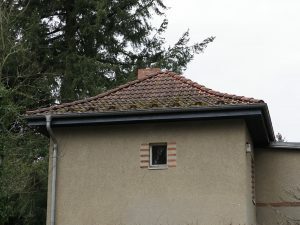 Most of the roofing was seen to have large clay bonnet type air vents installed in abundance, particularly interesting to me as I commonly find that roofing is poorly ventilated in the UK. 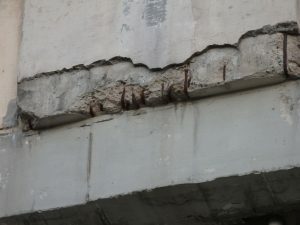 For those of you thinking about teutonic efficiency in construction it was interesting to note that many of the defects that plague 1960’s large panel concrete construction in the UK also affect similar construction in Germany, in particular I’m referring to the incidence of carbonation in concrete due to poor levels of concrete cover on the rebar. The building in question was a fairly typical low rise block of flats in Potsdam and given its close proximity to the beautiful old Potsdam cathedral it looked rather out of place in its surroundings. The construction of this block will be familiar to anyone in the UK familiar with this type of non-traditional construction,which was mainly erected by local authorities in the 1960’s, in a drive to meet the high demand for housing at that time. This particular block, though fully occupied was in a sorry state due to extensive spalling of the concrete due to carbonation and it was clear that concrete cover was very poor, perhaps being in the region of 10mm thick in some locations. Extensive repairs will be required to this block though it was interesting to note that a similar 1960’s block adjacent to this one was currently undergoing demolition. 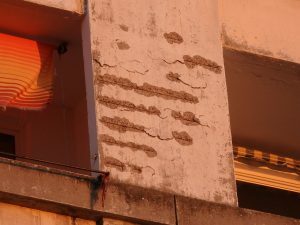 For the short term there has to be a concern for spalling concrete falling from the block, though given the lack of any notably loose concrete, it would appear that at least this issue is in hand; possibly with the building owner at least regularly inspecting the block and removing loose concrete before it falls from the block. 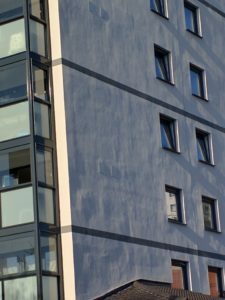 Some time back we blogged about a Midlands high rise EWI scheme that we’d monitored and noted that defects were being built in. Interestingly we have now noted very obvious visual signs of premature wall cladding failure. 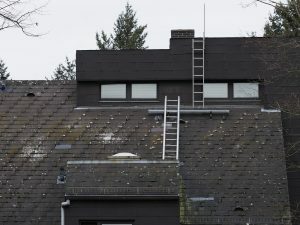 In fact we recently investigated a failed EWI scheme that exhibited a number of visual problems that were also noted on this scheme. 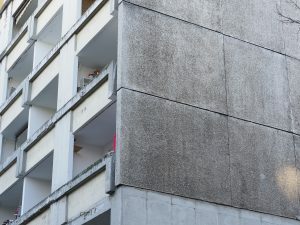 When you consider that it generally costs circa £1m to install EWI to a high rise block then system failures become extremely expensive to remedy. In this particular case I drove past the building today and immediately noted early visual signs of system failure, in particular, what we call ‘thin coat failure.’ The white finished render should be ‘in plane’ and present a smooth finish across the whole facade but in this particular case you can now see that the underlying Rockwool insulation slabs in the Alsecco system are clearly visible; so what causes this and what are the implications? We have previously written about the effects of pillowing and mattressing but this is something generally seen in Phenolic insulation boards, it isn’t a problem you see in Rockwool slabs. 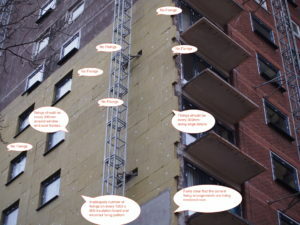 Please read http://buildingdefectanalysis.co.uk/solid-wall-insulation-ewi/a-case-of-pillowing-or-mattressing/ for more information. Since we had initially commented that insufficient hammer fixings were being installed to the Rockwool slabs then we also believe that there is risk of structural failure at the interface between the Rockwool slab and the underlying substrate. However, experience tells us that the visual evidence suggest something far simpler… The render base coat has probably been applied far too thinly. 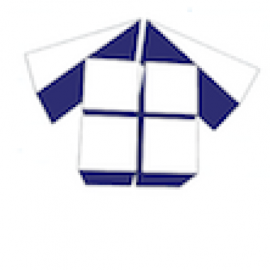 It is a problem that we are commonly seeing and we’re unsure if this is a result of the construction bean counters short ordering materials or whether it is simply down to poor site quality management? The problem with overly thin render coats stretches well beyond the obvious aesthetic problem and raises two key technical issues. An overly thin render coat does not have the same impact resistance. An overly thin render coat is more permeable and hence far more susceptible to penetrating damp and subsequent saturation of the underlying insulation. Another elevation with underlying Rockwool slab insulation clearly visible. So we believe that this system is suffering from thin coat failure and has failed prematurely on both aesthetic and technical grounds and we predict significant technical problems in the near future. The only subjective discussion is with regard to the degree of failure exhibited. You may wonder why these thin render coat failures are not immediately obvious on works completion and we think that is down to simple curing and shrinkage of the render, which can occur over a number of months; this project was only completed in October 2015 but visual system failures had to be evident months before we observed them. As the render coat shrinks back, it thins to reveal the underlying insulation boards, usually first noticeable when sunlight hits the elevation concerned. So, is there a remedy for this? 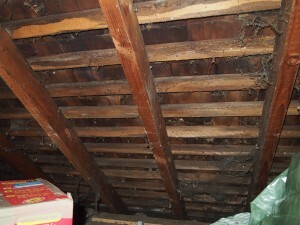 If caught early enough before water penetrates and saturates the insulation, is there a quick fix? Sadly no. 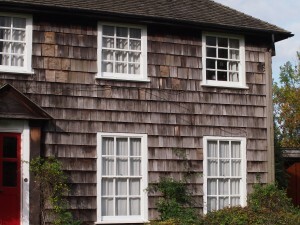 The problem is that whilst it may seem reasonable to offer additional coats to increase the render thickness, this system would no longer have BBA approval. The reason for this is simple… You would be applying further base coat over an existing topcoat but the system was never tested with base coat applied over topcoat and therefore would no longer be BBA approved. We have written correspondence from the BBA stating precisely that fact. Poor installation of Rockwool slabs. 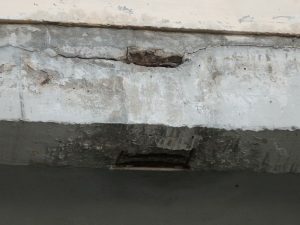 It is easier to contextualise this system failure when comparing the underlying defects noted as the system was being installed and here we can see the poorly installed rectangular insulation slabs that are now showing through the render coat. In our opinion both Rockwool slabs and EPS boards offer greater flexibility and potential for at least partial recovery of the EWI system but even retaining the insulation needs careful consideration based on a detailed investigation and recovery of site evidence. Timber Framed and Technically Obsolete. 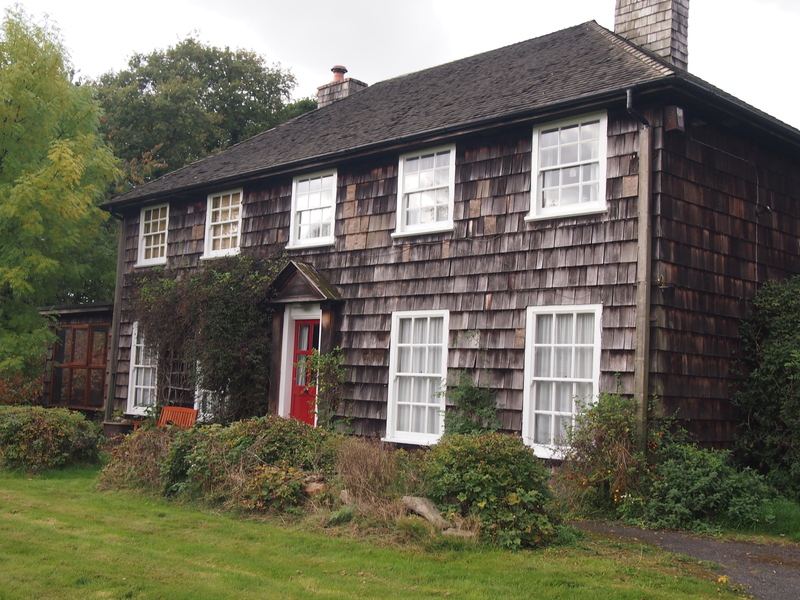 I was asked to carry out a survey on a fascinating building this week, a very rare 8 bedroomed timber framed building. I’m told that there are only two of these buildings remaining in the whole of the UK so its highly likely that I won’t see another one and most of us won’t see one of these buildings in our whole career. The building remains largely unchanged from the day it was built. The building currently has a wall U-Value of around 2.1 W/m2K which is as bad as you’re likely to find and well below the current UK building regulations requirement for 0.16 W/m2K. There is no functional central heating system installed and residents gain what little warmth they have from an AGA in the kitchen, which is where they spend most of their time. It’s fair to say that they are built of sterner stuff than most of us, myself included. You won’t find any reference to this particular building in BR282, ‘Timber frame housing 1920–1975: inspection and assessment.’ The building was constructed in 1941 when masonry construction was the norm but I think there was a need for rapid construction and anecdotally I’m told that the building was used as accommodation for land girls during WWII. Most timber buldings constructed at this time were platform framed but we’d need a more invasive inspection to confirm the exact method of construction. We think that this is post and beam construction, or a structural frame of widely spaced timber posts with infill studwork set between the sole plate and wall plate. Joisted and planked flooring and 4″ x 2″ rafters fixed to the wall plates at 400mm centres. 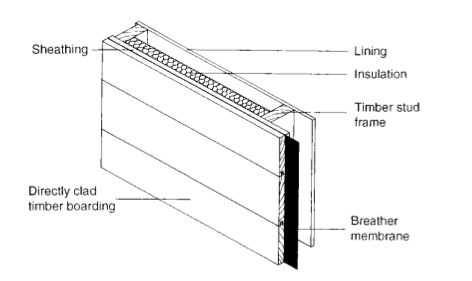 Roof battens are 3″ x 1″ and closely centred to allow for a large headlap to the cedar shingles, because the roof has no sarking membrane installed. The internal walls are clad with plasterboard, which came into common use during the 1930’s. The building’s timber frame is built off traditional brick footings, to which a timber sole plate is attached, the timber frame is then built off the sole plate. There should be a physical damp proof course between the brick footings and the sole plate and indeed, the timber sole plate can be weak spot in these buildings as they are subject to timber decay. For a full assessment of these buildings the sole plate and the base of the timber posts should be opened up for inspection. However, for a timber framed building approaching 75 years old this in in remarkably good condition and serves as an interesting historical marker with regard to the need for rapid construction in the 1940’s. The walls of our building have 4″ timber studding at 400mm centres that is externally sheathed with timber, however where the technical detail differs from the image is that this building has no insulation installed and rather than external timber boarding, this buildings is clad with cedar shingles. 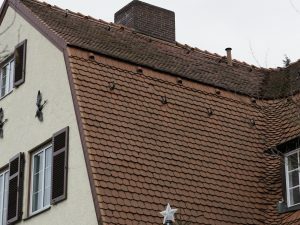 The roof is also clad with timber shingles. 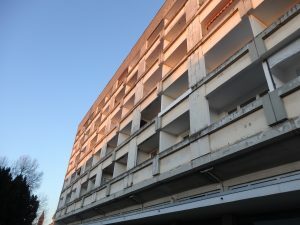 Whilst the technical details are interesting, the very obvious problem is that this building is technically obsolete and can not provide the level of thermal comfort required for modern living. In fact, there is an oil fired central heating system installed but heat losses were so great in the building that once the system failed, the occupants had no interest in getting it repaired due to the high cost of heating the building. Unsurprisingly, the occupants tell us that the building is incredibly hot in the summer and incredibly cold in the winter. 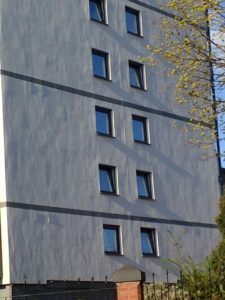 We understand the need to retain the external appearance of this building and we see no reason why this building should not provide accommodation for another 75 years, however, to achieve that aim, a substantial upgrade in thermal insulation is required, either internal wall insulation (IWI) or external wall insulation (EWI). Installing IWI, using something like 93mm Gyproc Thermaline would future proof this property without affecting the external aesthetic appearance but there would be a loss of internal floorspace, not a particular concern in a property of this size, however, this would involve major upheaval for the occupants and would also not deal with another concern relating to poor security. You’d gain entry into this property within two minutes with a decent battery powered circular saw. 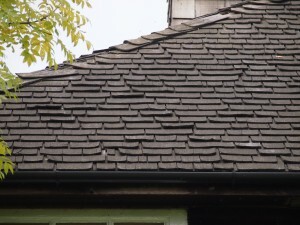 Cedar shingles can be retained. 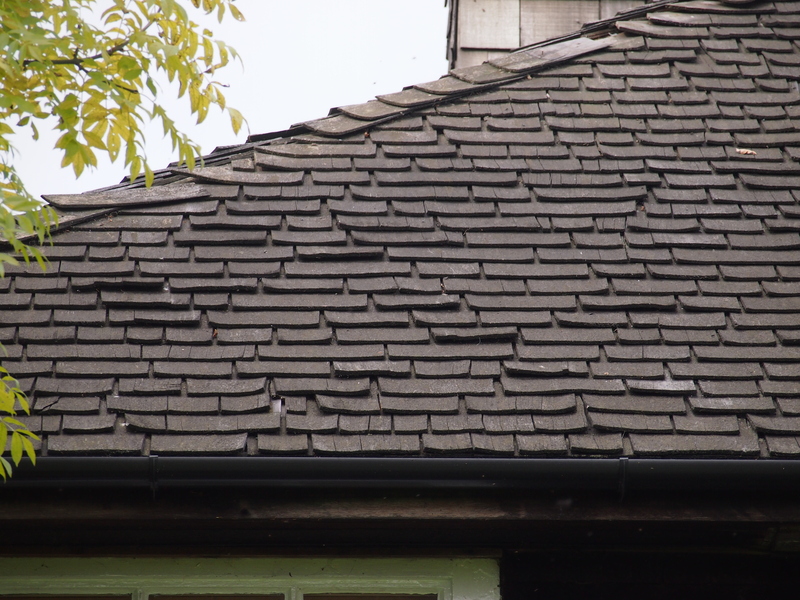 Our preference would be to remove and store the cedar shingles and clad externally with a structural external wall insulation (SEWI) system, Structherm or similar, the building lends itself very well to this approach since it has a wide soffit detail. The SEWI could then be over clad with the existing cedar shingles and the aesthetic appearance would be retained bar the fact that windows would be noticeably set back, a feature that would afford better weather protection. Whatever approach is adopted, this is a fascinating building that thoroughly deserves a new lease of life.